The Alberni Valley Chamber of Commerce and nearby residents are fed up with the dangerous parking situation at Cathedral Grove. The Alberni Valley Chamber of Commerce is fed up with the province’s lack of action on what members say is a dangerous parking situation at Cathedral Grove on Highway 4. It’s one of the most popular destinations between Parksville and Port Alberni—and that makes it one of the most dangerous, according to chamber executive director Bill Collette. “There’s millions of vehicles passing through there every year. We’re talking a major roadway,” said Collette. Such heavy traffic had led to many close calls, according to a longtime Cameron Lake resident who has written countless letters to both provincial and federal agencies for more than a decade, with only one response. Gillian Mead-Robins, whose family has owned a cabin at Cameron Lake since the 1920s, says she constantly hears tires screeching as vehicles try to stop. “I’m in one of the cabins near Cathedral Grove and I hear the brakes screeching numerous times and just hope that no one’s been rushed off to hospital,” said Mead-Robins. Collette said that the visitor centre’s ambassadors—mobile tourist information volunteers—are just as concerned. But according to Collette, the Ministry of Transportation doesn’t seem to see the same level of urgency. “Our issue is not so much any specific ideas but it’s more that ‘come on, highways, you need to do something’,” he said. The Ministry of Transportation (MoT) say they have done something to alleviate the situation. “The ministry recognizes this is a busy stretch of highway for motorists and pedestrians alike, which is why a reduced speed limit of 50 kilometres per hour has been implemented at this location, as well as two speed reader boards along the approaches to the park to remind drivers to slow down and enhance their awareness of traffic and pedestrians,” MoT public affairs officer Sonia Lowe wrote in an e-mail. According to Mead-Robins, that hasn’t helped enough. “That’s all well and good but it does not help the parking problem,” she said. But to Collette, that’s not enough. He also sees an internal walkway as essential, even if it means losing a few trees. Mead-Robins said that a suitable area has already been identified. “The area where they were going to do a parking space years ago is a wonderful idea because it’s an old logging road so there’s not many trees that would need to be taken down,” she said. The logging road, located just west of the current parking area, is currently blocked off by yellow gate to reduce vandalism but isn’t being used for anything. A way to get across the busy highway is another necessity for both Collette and Mead-Robins. “Then there needs to be a mechanism to cross the road because right now, people are lined up and they’re trying to cross the road. There’s grandmothers in wheelchairs and there’s kids. It’s a gong show. So we’re suggesting a foot overpass,” Collette said. The overpass would be wheelchair and stroller accessible, he added, and start right at the main parking lot area. When contacted, MoT didn’t give details as to what they thought of Collette’s pitch. 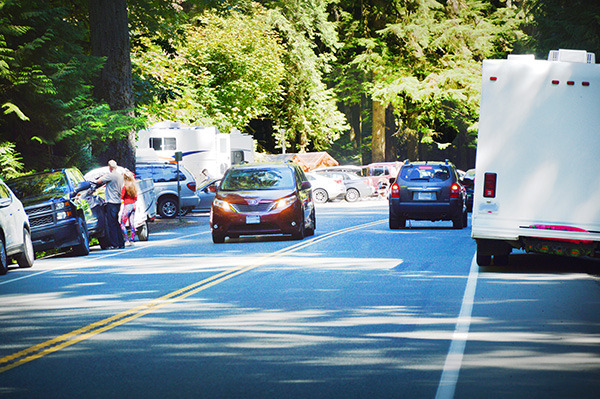 “Ministry staff remain committed to continuing to meet with the Alberni Valley Chamber of Commerce to explore and discuss opportunities for safety improvements for pedestrians and visitors in the Cathedral Grove area along Highway 4,” Lowe said. Neither details nor cost estimates have been offered to the chamber, Collette said. “No one’s shared any numbers with us. They say it’s high on their priority list but I don’t think it’s high enough,” he said, adding that the province’s continual repairs and improvements to the Malahat down-Island prove that it has the money to fix up Hwy. 4. Otherwise, he says, it’s only a matter of time until someone gets hurt—or worse. “People are opening their doors up and there’s a semi coming. Kids are getting out on the lane side of the car. People are walking on the road to get back to their car or to get back to Cathedral Grove because there’s no walkway,” said Collette, adding that he’s worried that the situation could turn tragic at any moment. “Ultimately, if they don’t someone’s going to pay the price. Maybe that’s going to be you, maybe that’s going to be me. I don’t want to pay that price and I don’t think you do.